Produktinformationen "SecuritySpy 3.x (englisch) 16 Camera Lizenz"
Für weitergehende Informationen bitten wir Sie unsere Hotline zu bemühen (Tel: 09131 9959053) oder aber auch in Englisch weiterzulesen. SecuritySpy will enable you to quickly set up an effective video surveillance (CCTV) system. Whether you are planning a basic home installation or a large professional system, SecuritySpy provides a rock-solid solution. SecuritySpy works with a wide variety of cameras to suit every need, from traditional analogue cameras to the latest high-resolution network cameras, offering unsurpassed video quality at megapixel resolutions. SecuritySpy's motion-detection feature will intelligently detect and capture events, while the remote monitoring feature allows you to view your cameras over the Internet from anywhere in the world. If you are building a video surveillance system from scratch, we can help you choose the right cameras to suit your needs. If you have an existing system using analogue cameras, SecuritySpy will enable you to upgrade to a computer-based digital system whilst still retaining your existing cameras and cabling. 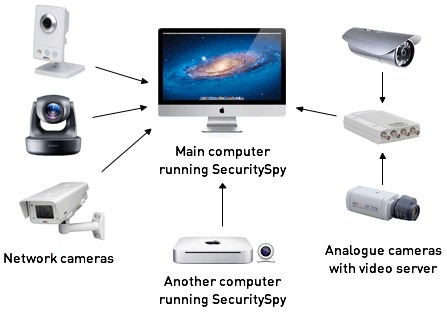 SecuritySpy can capture video and audio from multiple cameras at the same time - up to 60 cameras on the most powerful Mac Pro computer. Analogue cameras, network cameras, and network video servers are all supported. Flexible recording options to capture exactly what you need. View your SecuritySpy system over a local network or the Internet. Control your cameras directly from SecuritySpy. SecuritySpy supports most video and audio codecs (JPEG, MPEG-4, H.264, AAC, etc. ), for efficient storage of captured footage. SecuritySpy can either perform the compression itself, or save the compressed data directly to disk so that the camera, not the computer, is doing all the work, resulting in the best performance and quality. Upload captured footage for off-site storage. SecuritySpy can send email notifications, play alarms, or run scripts when motion is detected. Weiterführende Links zu "SecuritySpy 3.x (englisch) 16 Camera Lizenz"